HOME / BRIDAL JEWELRY / Wedding Bracelets / Simona - Royal Collection - Couture Elegant CZ bracelet - Amazing Price!! Description: NEW!!! 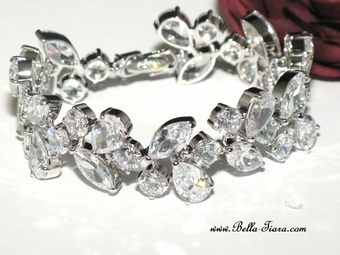 Gorgeous Couture Elegant CZ vine wedding bracelet. measures approximately 1" wide 7" in diameter fits average wrist size... gorgeous look.